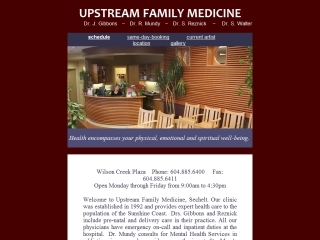 Upstream Family Medicine in Wilson Creek, Sechelt BC, was established in 1992 and is providing expert and caring support in all health issues to the population of the lower Sunshine Coast. Hospital emergency and inpatient care are part of our practice. Drs. Gibbons, Dr. Reznick and Dr. Lasuta provide pre-natal and delivery care while Dr. Mundy consults Mental Health Services in addiction issues and provides anaesthesia at the hospital.